Live updates from Race Three at theTasmania Microsoft Office 365 at Symmons Plains this afternoon. Weather is looking fine, with a few clouds, for today's debut of the ‘60/60 Super Sprint’ format. The race will consist of 25 laps and ahalf-time 15-minute break allowing teams to service the cars as necessarybefore heading back on track for another 25 laps of racing. The second half will begin with a double-filerolling restart and the order across the line after that second half will bethe finishing order, awarded points. Cars are all on soft tyres and will need towatch out at the hairpin – the slowest corner of the season. After an incident during Practice, it isbelieved Maro Engel has been penalised five grid positions to start from therear of the grid. Jamie Whincup starts on pole alongsideFabian Coulthard, followed by Mark Winterbottom, Garth Tander, Jason Bright andWill Davison. Cars are off on the warm up lap. Whincup gets the jump on what appears a fairly clean start. Lowndes in the dirt and then goes around. Big cloud of dirt as Holdsworth is in the dirt. L3 Damage to the front of Pye's car. L4 Safety car to be deployed, Lowndes in pits. Initial contact with Van Gisbergen seems to have triggered Lowndes' off-track excursion. Russell Ingall claims he did not make contact with Lowndes. L6 Restart with Whincup still up front. McLaughlin battles up the inside of Van Gisbergen for 7th. L7 Debate about whether Lowndes will be issued a penalty for wheels spinning during pitstop. L8 Fastest lap for Fabian Coulthard (L6), the first driver into the 51s for the race. L9 If Red Bull Racing can't prove gearbox issues, Lowndes will receive a penalty for spinning wheels in the second half of the race. L11 Jason Bright putting pressure on Garth Tander. L12 Timing shows post race investigation cars 360 - Moffat - and 4 - Holdsworth. L15 Coulthard (second) out wide, increasing the gap to Whincup (first). L16 Winterbottom (third) right on the back of Coulthard at hairpin. L17 Reynolds wide dropping from tenth to p13. L20 starts - five to go until half-time. L21 Bright nudges Tander after #2 runs wide at the hairpin. Fighting for fourth. L22 This has allowed Will Davison through and up to fifth. L24 Van Gisbergen tries up the inside of Bright with one to go before half-time. L24 Whincup sails over the line in first for the first lap with a gap of over 2 sec. Webb make up the top 10. Drivers out of the car for now. Top seven remain as they qualified. Tander said car went taily as the race went on. Will change a few things set-up wise for the second half, as well as looking at brake issues. No problems with Bright's car after the contact. Bright said he was far enough up on Tander for the pass. Doesn't feel he was left enough room. Lowndes said there was a flat tyre and no first gear after the contact with Van Gisbergen. What will happen to his championship after this race? Drivers getting back in the cars, ready for the second half. Todd Kelly stopped on track before rolling start, near pit exit. Looks awkward for cars trying to get to grid positions! Todd out of the car and running back to pitlane with 30 seconds until the start. Tander doesn't get off the line, but jumps in transit lane on the way up to fourth. Warm up lap behind Safety Car, then Whincup will accelerate for the rolling start. Cars starting to form the two lines... will it get messy? L26 (First of restart) First three cars hold positions, while Pye goes off into the dirt. L27 Coulthard side by side with Whincup from the hairpin, as L28 commences. L28 Bright and Tander at it again with Will Davison buying into the battle. Bright through to fourth. L30 Tander in fifth, but Will Davison, Van Gisbergen and McLaughlin are close behind. L31 and top five are Coulthard, Whincup, Winterbottom, Bright and Tander. Will Davison close. L33 Will Winterbottom catch Whincup? 0.25 secs in it. Todd Kelly disappointed he still hasn't finished a championship race this year. L37 Bright with two wheels in the dirt up behind Winterbottom. Bright in fourth. Brad Jones said Coulthard was great under pressure - let's see if he can hold on and take the win. L40 Battle at the back of the pack with Rick Kelly taking p21 off Fiore. 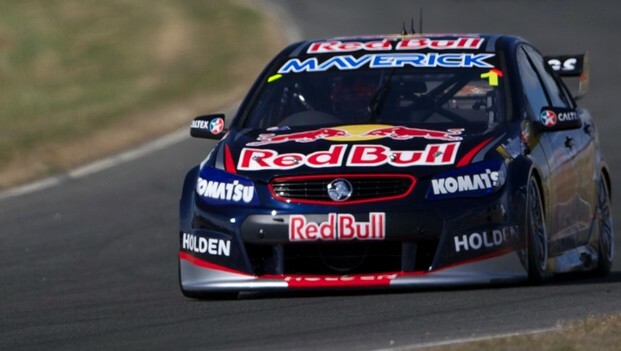 Prov points show Whincup first and Lowndes slipping to third. L42 Tander back on the back of Bright - these two have had a great battle today. L43 Engel off - looks like it's stuck. Safety Car deployed. L45 Back racing! Winterbottom expected to pressure Whincup for second after Whincup's ordinary restart. L46 and it starts to spit. L48 with top five - Coulthard, Whincup, Winterbottom, Bright, Tander. L49 report #14 will be investigated, maintaining speed after Safety Car. That's the race leader, Coulthard! FINAL LAP - Whincup, Winterbottom, Bright so tight into hairpin. And we're done - Coulthard crosses the line 1.1381 secs ahead of Whincup. Winterbottom third, Bright fourth, Tander fifth, Will Davison, Van Gisbergen, McLaughlin, Courtney, Webb. Results are provisional, with the winner under investigation. Top five in Championship looks like Whincup, Will Davison, Lowndes, Courtney, McLaughlin.